It’s time to renovate your bathroom. One of the best way to add value to your home is to renovate your bathroom or to add an ensuite. 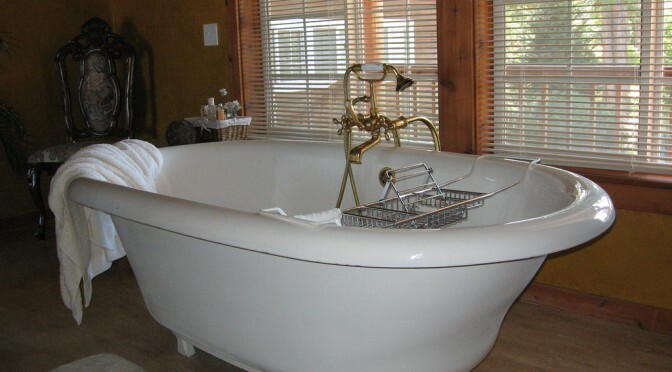 Check out this great photo gallery of bathrooms for some inspiration. You don’t want your classic claw foot bath to fall through the floor. The weight of a classic claw foot baths sits on just 4 ‘feet’. Don’t overload your floor or floor joists. Get us to check the capacity of your bathroom’s floor or ask us to strengthen your bathroom floor. You want to put your sink in a new location and you have to cut your concrete slab to lay pipes in a trench. Reinstating concrete after it has been cut should be done with galvanised steel dowels to tie the new concrete to the old concrete. We’ll specify the size and spacing of the dowels and let you know if you need slab reinforcement. The tiles in your bathroom are drummy and you are worried about how to fix them. When tiles become loose in the bathroom, we’ll help you determine if there is slab movement of a problem with water seepage. You want to make the bathroom larger and need to remove or relocate a wall. Load bearing walls can be demolished once the roof has been re-supported and any bracing loads have been transferred. The window in your bathroom is too small. You’d like to install full height louvers instead. Louvers and new windows look great in bathrooms. If the opening doesn’t get any wider you might be ok otherwise we can help by specifying the lintel over the window and the number of jamb studs beside the window. You’d like the tiles of your bathroom floor level with your timber floor. New or old floors can be set down so that the tiles in the bathroom are at the same level as the rest of the house. We specify the work needed to remove the trip hazard at your bathroom and toilet doors. Call us to Get a Quote or ring for a chat. We’re here to help. Cornell Engineers. We’re structural engineers for Bathrooms!